Campers progress through skill levels in horsemanship, swimming, canoeing, archery and riflery instruction. Campers expand their experiences as they participate in sleeping under the stars, animal tracking, outdoor skills, drama, clowning, crafts, rocketry, cookouts, photography, kayaks, water toys, laser tag, campfires and participatory Bible Study. 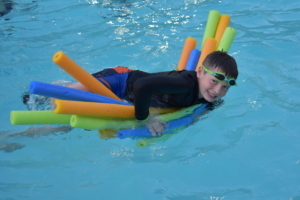 Our activity programming provides opportunities for campers to have fun while they discover and celebrate their God-given value, uniqueness and abilities. Campers develop increased competence and self-confidence, courage, and perseverance through learning and improving in challenging, skill-building activities.